Information on all magazine is, to the best of our knowledge, correct. If an error or omission occurs in the lot description we will contact the buyer to arrange a substitute or make a refund. Most magazines are in good to excellent shape unless otherwise indicated. Items with no price indicated are negotiable. All S&H charges are based on shipment within contiguous U.S.A. Double S&H for all other locations. 1. 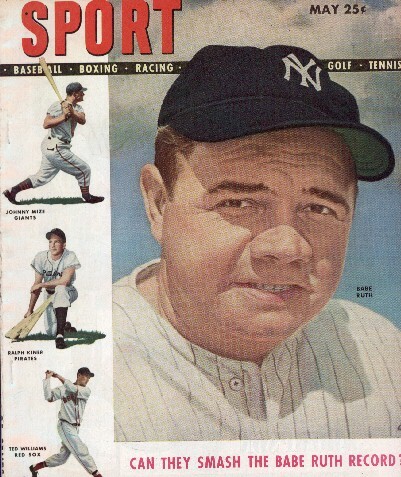 May 1948, SPORTS with Babe Ruth on cover. No tears or rips. Very minor crease in lower corner of pages and back cover less than half inch from corner. Magazine has articles about Babe Ruth, Ty Cobb, Bob Elliott, Dizzy Dean, Bobby Jones, Man o' War, and others. Made of Northern white ash. No. 302, Very good condition. 3. Philadelphia Phillies, 18 inch Adirondack bat. 4. Book: 1938 Major League Baseball Facts & Figures and Official Rules. Contains many photos and records from 1937. In good condition with some damage to cover. 5. Book: 1947 Major League Baseball Facts, Figures and Official Rules. Contains photos and records from 1946. Stan Musial on cover and Sophie Kurys on back. Inside has photos of the 1946 All-American Girls Baseball League All-Stars and records. Cover has minor rip and some pages are loose from binding. Great piece for the AAGBL collectors. 6. Book: 1961, How to Star in Baseball. Mantle on cover with instructional photos of major league player inside. Cover has couple of creases, however pages inside are good. 7. 1-1966 Washington Senators Souvenir Yearbook in good condition. Small piece of lower corner missing from cover. 1-1966 Washington Senators Scorecard Program vs. Cleveland, Possible opening day, scorecard marked, tear on cover. 1-1969 Washington Senators Scorecard Program in fair condition with missing scorecard. Prices are for the complete lot. Individual prices are for extra issues only. Minimum order is $10.00 for all horse racing magazines and newspapaers plus shipping and handling (S&H). Minimum shipping is $4.00. For items over $60.00 use 10 percent of order. All S&H charges are based on shipment within contiguous U.S.A. Double S&H for all other locations. Items before 1960 currently are not priced and negotiable. Various issues from 1946 to 1982. Magazines has few articles, stories, and limited handicapping information. Mostly filled with list of current horses. Various issues from 1939 to 1984. Issued on even months from 1979 to 1984. Issued monthly before 1978. 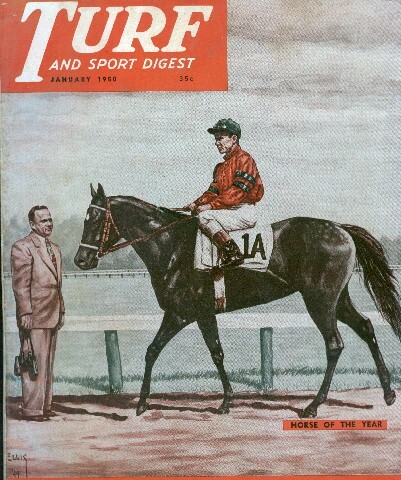 Magazine contains racing stories, handicapping information, current ratings, and photos of horses. Older issues have nice graphic on cover. Various issues from 1949 to 1983. Magazine contain handicapping articles, systems, and limited photos.